UE BOOM 2 pleads insanity. And it's guilty. It's the 360-degree wireless speaker that blasts loud, insanely great sound with deep, powerful bass in every direction - everywhere you go. 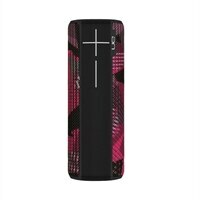 Ultimate Ears BOOM 2 Speaker For Portable Use Bluetooth - Twilight MagentaUE BOOM 2 pleads insanity. And it's guilty. It's the 360-degree wireless speaker that blasts loud, insanely great sound with deep, powerful bass in every direction - everywhere you go.